Best 40, 42 and 43in TVs: HD and 4K TV bargains | What Hi-Fi? TVs have just got bigger and bigger in recent years, which means suddenly, there isn't quite so much action at this screen size. The likes of LG, Panasonic and Sony don't spent too much time concerning themselves with smaller screen sizes - and lest we forget, a 40, 42 or 43-inch TV is still a very decent-sized screen. We've rounded-up our pick of the best 40 to 43-inch TVs to have been given the What Hi-Fi? review treatment to help you find a small(ish) screen bargain. It has its compromises, but this budget set offers a solid Full HD performance for not very much money. Sometimes you don’t need bells and whistles to get the job done well. This Finlux set, rather short on either of them, does just that, and all for just £250. There have been some understandable compromises, but they’ve been well handled so they’re far from glaring, ultimately creating a better-considered picture than we’d expect. Absolutely tremendous value for a 4K picture of this make quality. Among the best pound-for-pound TVs currently available. TV manufacturers might be doing their best to convince everyone they need a gigantic, IMAX-rivalling screen for their front room, but the truth is that for many people 40in is big enough. The good news for those people, as evidenced by the UE40MU6400, is that you can still get a great picture at that sort of size – and at a very affordable price. 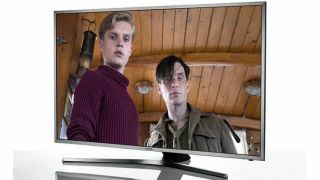 With the big TV manufacturers seemingly concerned only with selling the biggest, fanciest TVs in their ranges, it’s up to the likes of Hisense to deliver what many punters are screaming out for: a moderately sized screen at a low price. How low? For just £329, Hisense will sell you a 43in screen with an edge LED backlight and support for 4K and HDR. The HDR isn't brilliant, but otherwise the H43AE6100UK is in many ways quite a bargain.